Don’t think, just enjoy. We have problems, certainly, but beating Georgia is just a half step below beating Clemson in the rivalry pecking order. This game was talked about all summer as an elimination game in the East, and we walked out of Sanford Stadium with a win. Don’t ever take for granted a win on the road in the SEC, especially when it’s in Athens. As much fun as you can have with your clothes on. For sheer entertainment value, this is one of USC’s greatest games ever. It was a brutal and glorious roller coaster ride of a game that was hard to watch at times, and a tall, cold glass of liquid joy at others (metaphor alert!). I have seen Marcus Lattimore, and Isaiah Crowell, you are no Marcus Lattimore. #21 was having a quiet but effective day, but Sean McDonough and Matt Millen were too busy gushing over the exploits of Crowell to notice. 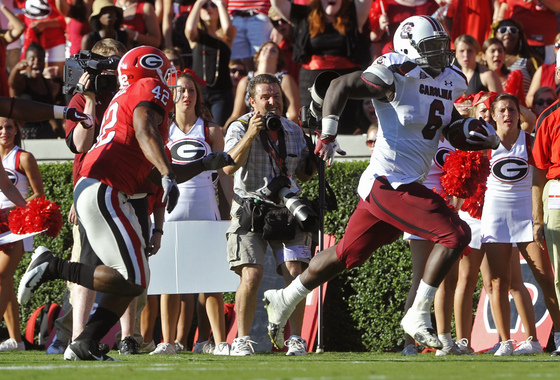 Until the fourth quarter, that is, and then Lattimore loaded the offense on his back and carried us to victory. He is special, and firmly put himself in the early Heisman discussion yesterday. Melvin Ingram, Melvin Ingram, Melvin BYGOD Ingram. I wrote in last week’s Snap Judgments that people need to start talking about Ingram. After yesterday, it will be impossible NOT to talk about him. The term freak is way overused, but it absolutely describes this guy. Bad Stephen, BAD. Tbone texted us yesterday morning and said he had a strong feeling that Stephen Garcia was going to have a major faceplant against UGA. Early on, it looked like his premonition was becoming reality. Fortunately, he never made any backbreaking mistakes and made a great throw to Ace Sanders late to get us in UGA territory. But Bad Stephen needs to go away. Forever. Thumbs up O-line. These guys deserve a mention for no sacks given up (at least that I can remember), and paving the way for Marcus. The secondary needs help. Stephon Gilmore played better, but CC Whitlock was beaten for two touchdowns, and Murray carved us up in the fourth quarter. Hopefully the return of Victor Hampton in two weeks from suspension will give us a boost. This is the area that really continues to concern me. Steve Spurrier is evil, and he is a genius. On the heels of a barely unsuccessful onside kick by UGA, SOS green lights (he says it was John Butler’s call) a fake punt with a 270-pound DL. Vintage Spurrier. Oh, and with the game on the line he makes the decision to feed #21. OK, you got me, that doesn’t take a genius to figure out. Random crazy stat of the night. With 3:30 to go in the third quarter, the score was 20-14 in favor of UGA. Over the final 18:30, we outscored them 31-22. Navy is terrible and we will beat them badly. << This is a false statement. Get yourselves ready, because this game is going to be a root canal. I think we win, but we will not feel good about ourselves when it’s over. In other news, CTU upsets Wofford 35-27. Not real fun to play those guys, is it Tigers? OL did give up a sack late, on the blitz by Branden Smith when Garcia got drilled in the back. Correct Matt, tip ‘o the cap.